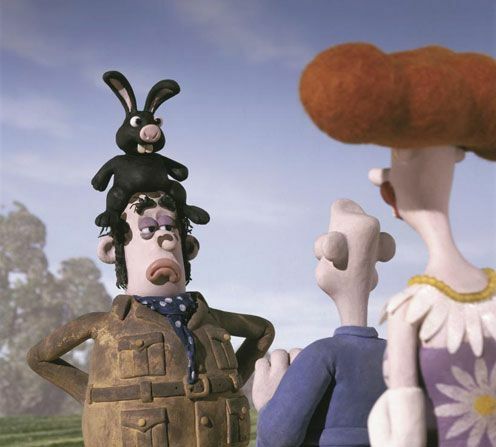 Aardman’s films brim with comedic delight. From the existentially-blighted animals of Creature Comforts to Wallace literally counting sheep in his Snoozatron, the gags are as plentiful as the plasticine is perfect. But look beneath the Pirate Captain’s swash-buckling bravado and Victor Quartermaine’s toupee, you’ll see that the humour runs deeper than Wallace’s love of cheese. Hidden inside the 50 sets exhibited in Wallace and Gromit and Friends are hilarious details so carefully sculpted they risk being overlooked, so get a good gander at these miniature artworks when you visit – just don’t stare too long into the dead eyes of Feathers McGraw. Aardman take any opportunity for a great pun even if it's only on screen fleetingly. When creating signage for the Shaun the Sheep Movie, they crafted their own style of vector icons. This way to the City Centre for a drink, a dance, a fight, a gyros and then a vomit. Note the Shaun backpack modelled from the one worn by Baby Spice that propelled Shaun the Sheep into the pop icon stratosphere. Where to find it: The Abbey Road case sits in the Drawing section of the exhibition. Notice anything fishy about the pirate ship? And the pirate ship is magnificent. So big in fact it didn't fit through the studio door and they cut through the wall to wheel it onto the set. Also note the cactus garden outside the home of Polly the dodo at the back of the boat, the rear-view mirror at the helm, and the bra and knickers hanging out to dry. Where to find it: The pirate ship sits in the Lighting section of the exhibition. The Pirate Captain’s quarters is filled to the brim with the wonderful and the absurd. A portrait of the Pirate Captain arm wrestling a pig sits alongside a train set and a beach bucket and spade. The Captain has even hung a gold ribbon he won for 'Best Anecdote About A Squid', the only thing in his trophy cabinet. “We populate our scenes with props because it gives it a richness and an atmosphere,” says Aardman co-founder David Sproxton. Where to find it: The Captains cabin set sits in the Drawing section of the exhibition. In Queen Elizabeth’s dining room, an elephant foot spins on a rotisserie during the Rare Creatures Dining Club as President Lincoln and others feast on shark fin soup, alligator steaks, toucan shanks and pygmy elephant nuggets. An interesting note that Napoleon, who sits at the table in the film, is strangely absent from the set. Did the French curators remove him? Where to find it: The Queen's dining room sits in the Architecture section of the exhibition. Try to make out some of the creatures Charles Darwin has stashed in his cabin. Weird and arcane creatures float in formaldehyde jars and are pinned to display cabinets creating an authentic collection of a biologist gone crazy. Even the facehugger from Alien has been deemed scientifically important. Where to find it: Darwin's cabin sits in the Nature section of the exhibition. Inside the Vicarage where Lord Victor Quartermaine discusses the problem of the were-rabbit with the Reverend, who says all they need to know is contained in a book. Quartermaine may want to look beyond the magazine on the table, Pro Nun Wrestling. Get ready to wimple. Where to find it: The Vicarage sits in the Architecture section of the exhibition. “The exhibition was designed around showing how much work goes in to getting a film idea onto the screen. I think one of the great delights of the exhibition is the artwork in itself as pieces of art are simply lovely. Even though they are mostly works in progress and stepping stones to something else,” said Peter Lord. For more insights into the magic of Aardman listen to the podcast with co-founders Peter Lord and David Sproxton.